The key to more traffic, leads, and sales is right there in your email list. Cogniter Technologies can transform your list into more clients and increased revenues. For all the proliferation of social media, email marketing remains a top way to earn a high ROI on your investment. According to some estimates, businesses can make $40 on every dollar spent on email marketing. In addition, this form of reaching out to new and existing clients has the potential to grow 10 percent year-on-year. 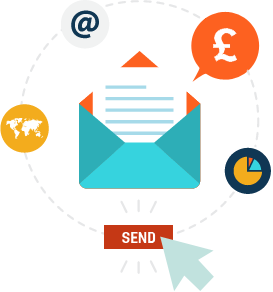 Being experienced in email marketing, we are ideally suited to be your partners. We take time to understand your business and customers before moving to capitalize on interactions. We have been running email marketing campaigns for clients in the U.S. and other countries for many years. Our experience across multiple industries helps us develop the right campaigns for you. We shared thousands of messages this year alone, and know what works. Our in-house team of writers and designers draw on their years of experience and extensive research into your brand to construct sensible, clean, lightweight, and attractive email templates. Our goal is to get your message across effectively. We use several advanced tools to manage your clients’ email addresses securely. We have the ability to incorporate several major CRM programs in our email campaigns and keep a detailed and accurate record of client responses. No longer do you have to stay in dark for days or weeks. We share with you real-time statistics on a regular basis. We also use analytics to optimize the emails to increase engagement and conversion; contributing to your campaign’s overall success. The changes made a huge difference to our sales.